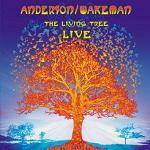 Live album featuring songs from The Living Tree plus some Yes classics! More information: Despite both Jon Anderson and Rick Wakeman having extensive successful solo careers stretching back to the mid seventies both Jon Anderson and Rick Wakeman will probably forever be associated with the Classic line up of British rock band Yes an throughout the seventies and for various periods in the eighties, nineties and beyond both artists enjoyed a fruitful and hugely successful working relationship as part of Yes. The duo however have worked together outside of Yes performing in the UK in 2006 performing both classics from the Yes catalogue and also selected items from the pairs individual solo catalogue. In 2010 it was announced that Jon Anderson and Rick Wakeman were to tour together once more with the tour taking place at the end of the year. The tour featured material from their time with Yes but more importantly material from the duos then new album The Living Tree. From this tour a compilation of live highlights from the tour has been compiled and overseen by Jon and Rick. The live album features songs from The Living Tree including: Just One Man, The Living Tree part 1,232411 and also a selection of yes classics including And You And I, Time And A Word and Long Distance Run Around.